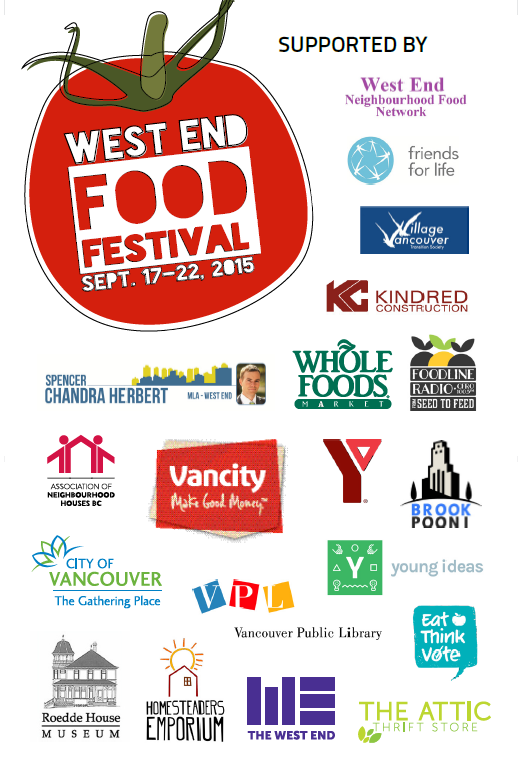 West End Food Festival 2015, September 17 to 22 (Thurs to Tues). Lots of great events! 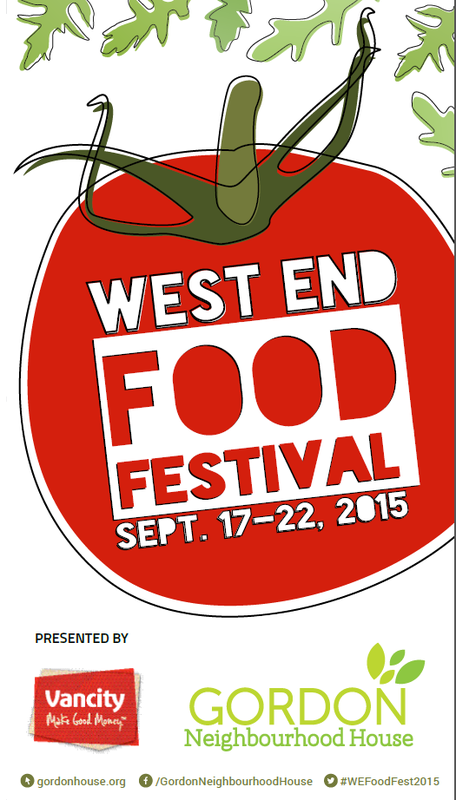 The West End Food Festival 2015 has many must-see events! It runs September 17 to 22, and involves many partners. Main website with calendar, event details, registration information: https://westendfoodfestival.wordpress.com/. 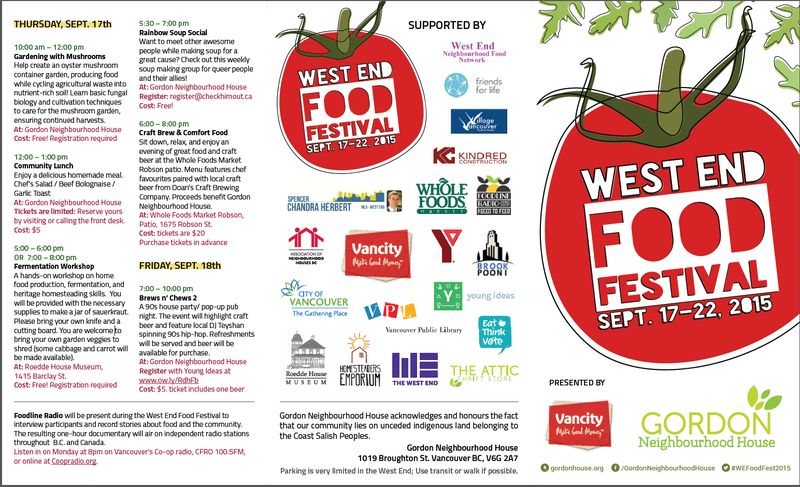 West End Neighbourhood Food Network (WENFN) is helping organize and sponsor the event. All events are great, and we encourage you to consider all of them, but the three specific events organized by WENFN are below. Native Edibles Workshop and Walk, Saturday, September 19, 2015 from 10:00 AM to 12:00 PM. Start at Gordon Neighbourhood House. It can be easy to forget about the wealth of food that grows all around us. In this workshop presented by the West End Neighbourhood Food Network, you’ll learn about edible plants that call our region home, and we’ll discuss how to identify and harvest wild, edible, and medicinal plants in an ethical way. Please wear comfy walking shoes! Meet at Gordon Neighbourhood House. Facilitator/Instructor Bio: Indigenous herbalist, Lori Snyder, whose lineage is of 5 Nations across Turtle Island, has been learning about plants all her life. Lori teaches gardening to elementary school children, hosts urban foraging of wild, edible and medicinal plants, and is walking fully into her legacy of sharing the wisdom of plants and self-knowledge. She is an advocate of local, sustainable and ethical living practices and envisions edible forest gardens throughout our urban cities. More info: ross.wenfn@gmail.com. Facilitator Bio: Makiko Suzuki is a community volunteer interested in all things related to food and gardening – both urban and wilderness. When she’s not harvesting tomatoes and citrus in her apartment, she’s fighting off industrial-sized slugs at the heritage Cougar Annie’s Garden. Ross Moster is the Coordinator and one of the founders of the West End Neighbourhood Food Network and other Neighbourhood Food Networks around Vancouver. A longtime advocate for community food resilience, Ross manages several collaborative gardens and seed libraries, serves as the Executive Director of Village Vancouver, and is a former member of the Vancouver Food Policy Council. To Register via West End Community Centre CLICK HERE. Or vist / call WECC (604 257-8333) and ask to be registered for course #10254, Community Potluck. In this workshop presented by West End Neighbourhood Food Network, we’ll discuss the best seeds to start saving, the easiest seeds to save in a small garden, and why and how to harvest, dry, and store seeds. Take home free seeds for your garden. Facilitator Bio: Rhiannon Johnson is a lifelong prolific gardener, growing multiple harvests of veggies and fruits abundantly each season, and teaching others how to do it too! She likes explaining ‘why’ things happen and her Bachelors in Biology helps her do just that. She grows the best high-octane catnip around which she shares with her cat friends and crunchy veggies which she shares with her people friends. To Register via the Community Centre CLICK HERE or visit / call WECC (604 257-8333) and ask to be registered for course #10182, Saving Seeds. 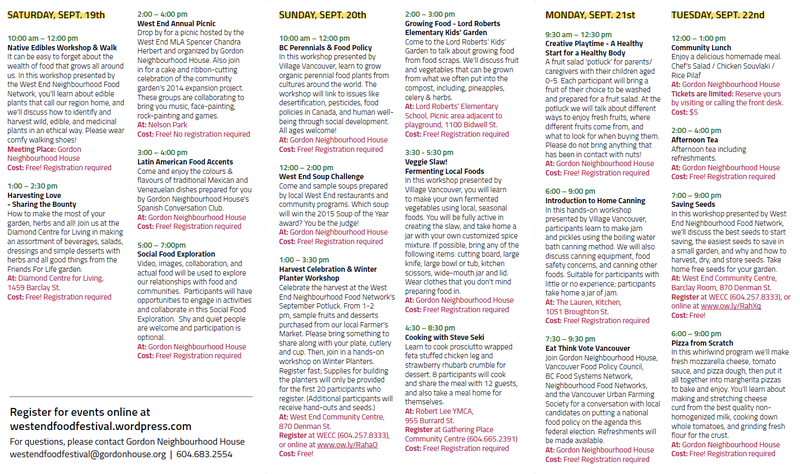 We also give special mention to three events by partner group Village Vancouver.